I’ve been very busy but two months is a long time since the last post and I shall endeavour to do better. One of the things that has taken a lot of my spare time in the last months has been teaching myself to draw using a 2D CAD program. I didn’t do technical drawing as an apprentice and I’ve always looked upon drawing as being such a vital skill, especially if you need to be able to get work made out by others. Of course, you can do a lot of things with a simple sketch, but it’s undoubtedly quicker and simpler (once you know how) to make changes and amendments using a digital file. Also, where clearances are tight, and dimensions are precise, because it shows (of course) a true representation of what you are wanting to produce, it enables you to see more easily any mistakes you may have made in measurement or design. Like pretty much everything I do, 2D CAD is so old hat that on one hand it almost seems ridiculous to talk about it but it’s new to me and I think it’s the most exciting and interesting development in my education for years. The initial incentive to push myself to learn how to use CAD was that I found myself unable to find a particular component for a Scott engine that I’ve been working on. 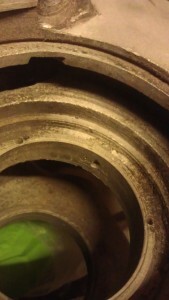 It’s a mid twenties engine and it had a bearing cup which was both corroded and cracked. Enquiries about a replacement cup with those associated with the rebuilding of the older engines have been fruitless. 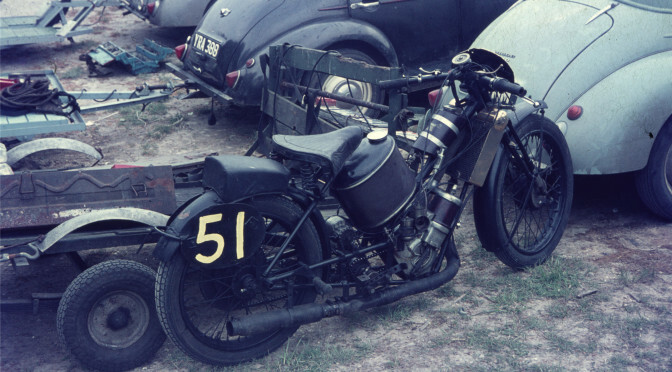 However, before I go any further I should explain a little about the main bearing assembly of a Scott and why repair or replacement presents more of a challenge than for many other engines. The Scott engine has its two crank-chambers separated by an external area which houses the central flywheel. Inside late twenties Scott crankcase. 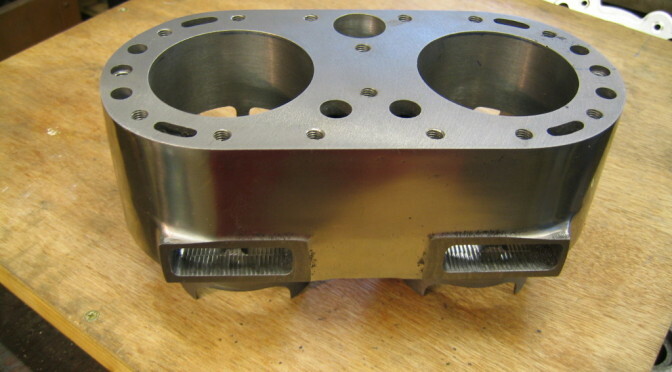 The crank-chambers themselves are very slim by design so as to maximise the crankcase pumping effect and so is therefore the main bearing assembly, crank assembly and big end / rod assembly. The main oil feeds are visible on the picture and are fed direct to the main bearings. These are (generally) fed by a metering unit called a Pilgrim pump (sic) which allows the user to adjust the quantity of oil delivered to each cylinder. The delivery rate in use is defined by the engine speed. The main bearings and big end bearings are roller bearing units, which involve outer and inner races that are made specifically for the Scott. Rollers themselves are fortunately still available (!) but if Scott bearings are damaged, the work to ensure the accuracy and fit of the replacement assembly requires a great deal of precise toolroom work. Scott main bearing bearing ‘cup’ in engine. 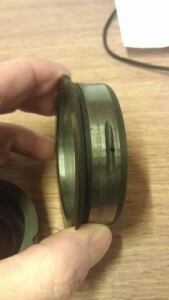 and you can see here the corresponding hole in the outer diameter of a main bearing cup. The groove is to give some rotational tolerance when fitting the cup. I will one day go through the operation of the metal to metal sealing arrangement of the crank-chamber, but suffice to say that it is a spring loaded seal that in Scott circles is called a ‘gland’. 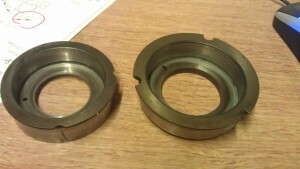 but back to the bearings. 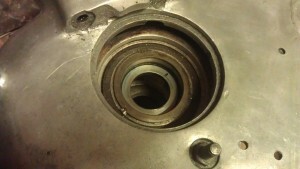 The bearing outer is retained in the crankcase with an interference fit. This fit is necessary to provide strength to the bearing ‘cup’ during operation and to mitigate against the differential in thermal expansion between the steel cup and the aluminium crankcase. 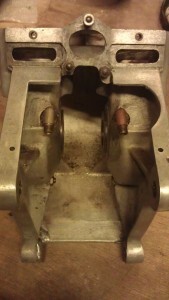 It also has to ensure the constant seal for the oil feed between the crankcase and the cup. Even if there is no problem with the bearings themselves this interference fit diminishes over time and the cup can become less well secured. 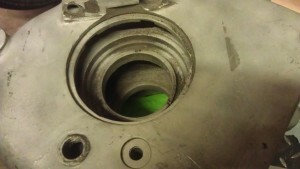 This can become evident by oil leaks noticed in the central flywheel area. Sometimes this can be oil leaking past the gland but sometimes it can be leakage at the connection of the oil feed drillings. It’s also very noticeable when you remove an old cup… often they require very little force to knock out. The cups when newly fitted have 0.005″ interference between the outer diameter and the bore in which they fit. This means that fitting is done with a cold bearing in a hot crankcase and can be a bit ‘heart in mouth’. It is a real pain if the cup isn’t exactly square going in. And that’s the start. You then have to make a steel ring that fits in an annular groove in the aluminium around the main bearing. This steel ring (called a shrink ring) is made to have 0.009″ interference between it’s ID and the corresponding diameter of the groove. The shrink ring is then heated until it’s red hot and dropped into position. After all this, the mouth of the cup which is not supported in the same way as the rear, is compressed so that the bearing track is now tapered. The whole lot must be ground in situ… which is another story. 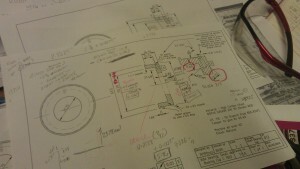 Anyway, back to my CAD drawing. I had an-usable cup and needed to have one made. Although I have some copies of Scott drawings I don’t have one for this particular component and so I thought I must make a drawing myself. After considerable efforts to get on top of the process, I am really happy with progress. Hopefully I’ll have it finished by the end of the week. work in progress. 1925 Scott crankcase cup drawing.